When you need a fresh perspective on an existing video clip, Dashcam Detective may be able to help. Uncovering additional insight that might have been missed by others is a skill set Dashcam Detective earned over the past 30 years of being both a camera person and an editor. San Francisco Giants President and CEO Larry Baer apparently wanted his phone and his wife refused to give it to him. His entire action was devoted to getting his phone. Her entire action was to deny him access to his phone. She is the one gyrating in the seat and flailing her arms to keep the phone away as he continues to try to get his phone. Her flailing arms changed positions which caused her weight and balance to shift on the seat. Even as she was falling he was still looking to get his phone. Normally a person who wanted to harm someone or assault them would focus on the person. Yes, the video looks bad, but study it closely and see that the case CANNOT be made that he threw her to the ground. There is the issue of speculating what caused the drama. Assuming his wife was trying to find something on his phone that he did not want her to see, he still had the right to get his phone back. Or... was he trying to find something on her phone that she did not want him to see? (the second scenario would change everything of course and it could be viewed as assault, although, if someone was involved with one's wife, the husband would want to know who it was so they could see if they could be in danger). 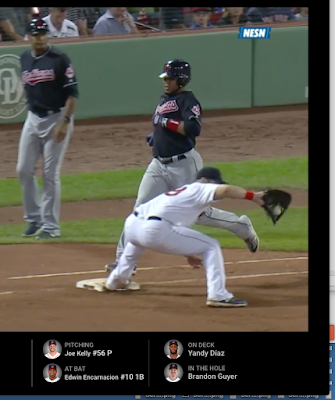 There is something ironic about Major League Baseball probably not even using their own Instant Replay Department to evaluate what actually happened. I don't believe she was thrown to the ground, I think the drama of two people in complete opposition to each other is the real issue here. I think the scream was not because she was falling to the ground, I think the scream was about not giving up the phone. This changes everything. The scream was not about falling, it was about ownership of the phone that was in her hand and also about ownership of whatever content was on the phone that the two were fighting about. Changing this to a domestic violence issue changes the truth of the situation, who owns what, and what is somebody allowed to do to get their property back before information is revealed that the alleged aggressor possibly did not want revealed. Jim Joyce Safe Call in the Imperfect Game between Detroit and Cleveland on June 02, 2010 might have been the Correct Call. 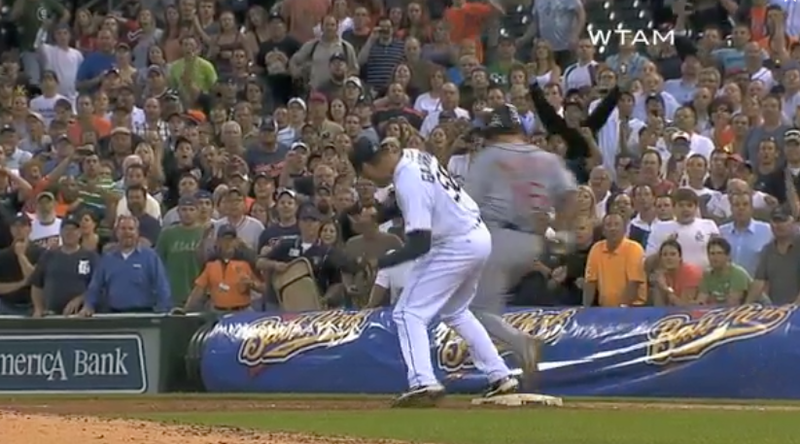 This is a quick link to the GIF that shows the final moment of the out that wasn't, or the safe call that was in the Imperfect Game of June 02, 2010 between the Detroit Tigers and the Cleveland Indians. Before you read this article, here is the shortcut version. Armando Galarraga absolutely bobbled the ball at the very beginning of the play, and also after Jason Donald had crossed first base. The last piece of critical evidence is unfortunately too vague to know for sure. Was there a third bobble in between the first bobble and the final bobble? Anyone who won't acknowledge that there were for sure two bobbles hasn't bothered to even research the still images provided further down this page. If there was no third bobble, then Donald was probably out at first base. 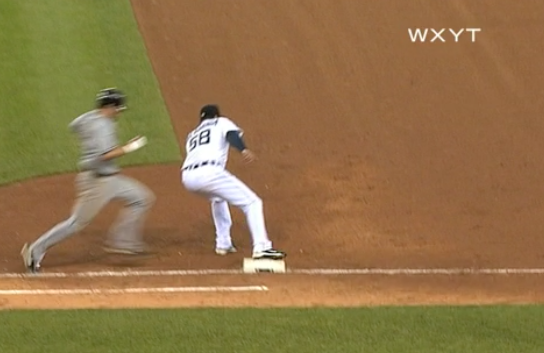 If there was a third bobble, then Donald was safe at first base. Directly below is the sequence surrounding whether or not there was a middle bobble in between the first and final bobble. Was Galarraga's elbow colliding with his own thigh enough of a jolt to cause the ball to either jostle, bobble, trombone or the seams to spin while snow coned within the webbing of the glove? One thing we do know, James Joyce would have had the best view of the ball possibly moving or spinning since the ball was snow coned and Joyce had the best vantage point of everyone in the ball park to see this. It would be amazing if Major League Baseball took it upon themselves to review this play and analyze if the ball did move in any way during Jason Donalds final 1/2 step before he touched first base. These four consecutive frames show that the glove is moving laterally. What we can't tell is if the ball inside the glove is truly contained and not moving, spinning, rotating, or tromboning. The telephoto nature of the shot compresses the action. If you look directly below it looks like the glove is touching Galarraga's thigh, yet from a different angle we would see the Glove is actually a foot in front of Galarraga's thigh. So if the ball was tromboning within the webbing this particular telephoto camera angle would not be able to show that. If the ball is tromboning, the seams of the ball would most likely be rotating or changing relative position to the webbing around the ball. Galarraga never really established that he was stable at first base specifically because he had to run over from the pitching mound. Ideally, if the ball could have been throw half a second sooner it would have allowed Galarraga enough time to snare the ball and then just focus on touching first base with his foot. Probably only Major League Baseball can resolve whether or not there was a middle bobble in between the first and last bobble. 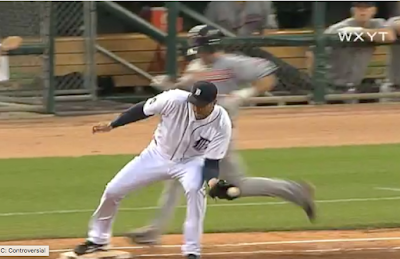 MLB could review the original camera footage and study the actual seams of the ball while it was in the webbing of Armando Galarraga's Glove just before, during, and right after Galarraga's elbow contacted his own thigh which caused a quick jolt to go through his forearm and glove that could have caused the ball to move differently from the surrounding webbing. 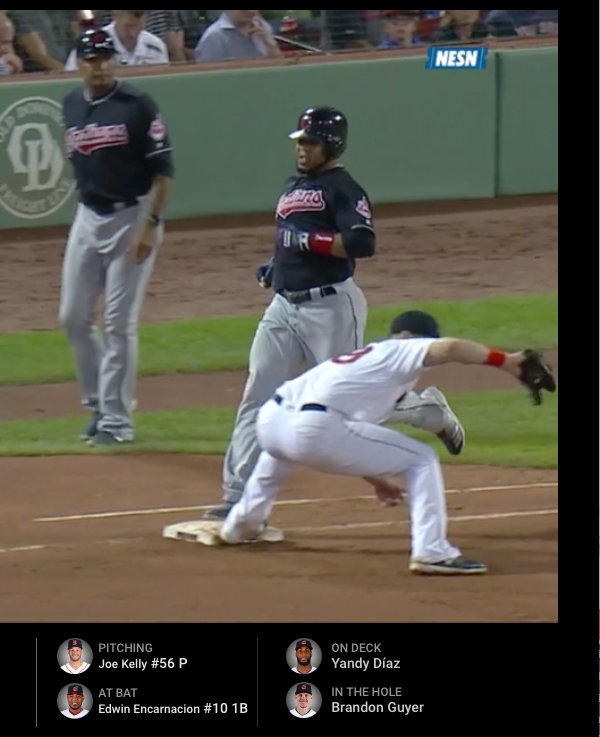 Either way, it is obvious this play was a lot more complicated and nuanced then has ever been reported, and that lack of acknowledgement regarding the complexity of the play has resulted in an unfair, condescending and judgmental assessment of Umpire Jim Joyce's call of safe on the play that would cause the Detroit vs. Cleveland game to be known as "The Imperfect Game". The accusation that the play was not even close at first is completely inaccurate and an unfair way to judge the Umpire making the call. 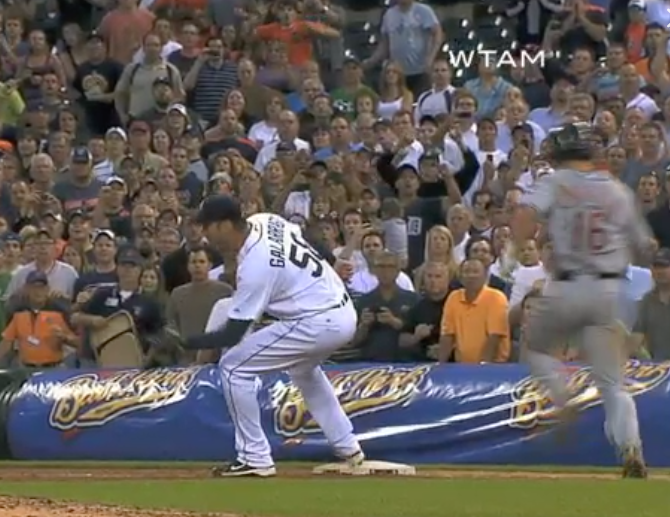 On June 02, 2010 Armando Galarraga's perfect game came to an end with batter number 27, the final batter needed for a Perfect Game. 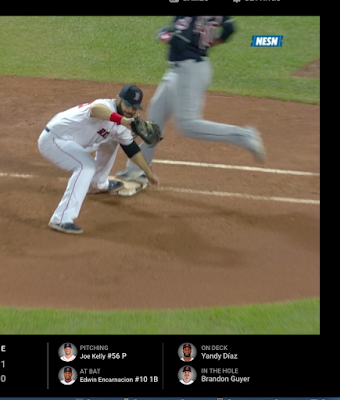 The entire media world basically believed that Umpire Jim Joyce got the safe call at first base, wrong, and that it wasn't even a close play at first. Dashcam Detective (DD) challenges the long held belief the play at first base was even't close, it was a very close play. 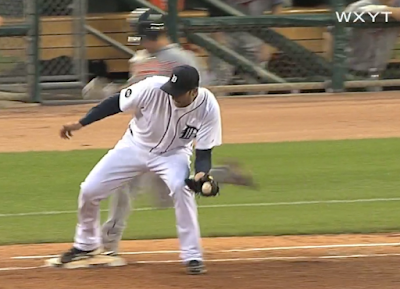 DD will also show evidence that Umpire Jim Joyce may have gotten the call correct because the ball may have been bobbled by Armando Galarraga as he attempted to get the final out of his Perfect Game at first base. Criteria Number 1 missed by the Media. or just as the ball first entered Armando Galarraga's glove, both freeze frames failed to show what was going on from Jim Joyce's Point of View. Apparently the emotion of the moment was so great after the call of safe at first base by Umpire Jim Joyce that not only did the Media want to believe Umpire Jim Joyce got the call wrong on what would have been the final out of a Perfect Game, the Media seemed on a mission to prove to themselves and the world that the play at first base was not even close and that Jim Joyce had allegedly missed the call by a lot. What Dashcam Detective's research has found is Miguel Cabrera's throw had a lot of spin on it. The ball hit the lower pocket / inner heel of Galarraga's Glove and bounced forward inside of Galarraga's glove, possibly still spinning. 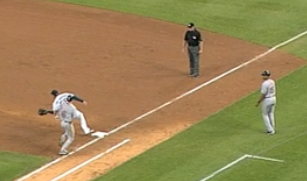 It took FOUR additional video frames for a total of five frames, or 1/6th of a second (Donald would have traveled another 4 to 4.5 feet down the line during that 1/6th of a second) before the ball finally temporarily nestles in Galarraga's Webbing. 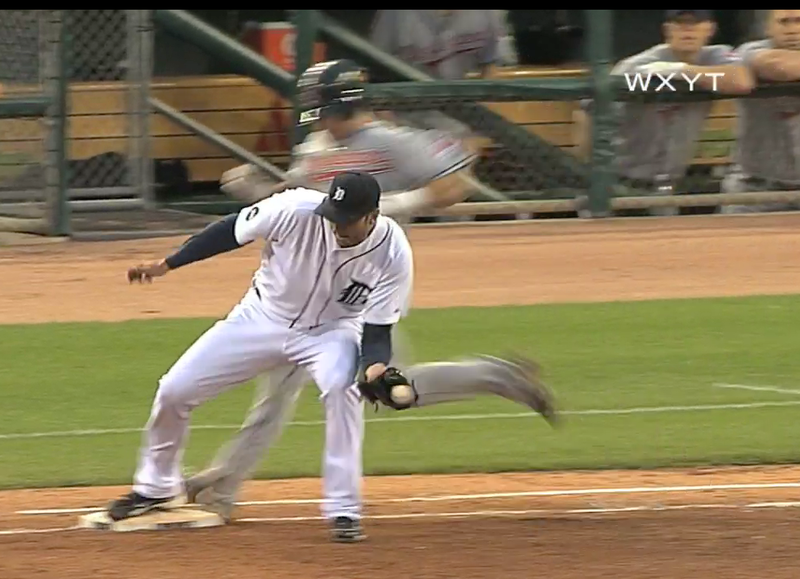 The Tigers Instant Replay Crew incorrectly chose to freeze the frame that showed the ball first reaching the glove. From Umpire Jim Joyce's vantage point he would have seen the ball ricochet because the ball ended up snow coned in the webbing of Galarraga's glove. Below is a frame by frame recap of what happened. Above, Ball is just about to enter Galarraga's Glove. Above, Ball hits back inside pocket and heel of glove and begins to bounce forward, the ball clearly had some velocity at this point as can be evidenced by the blur of the ball inside the glove. Above, Ball moves forward to the center of the glove. You can check for the accuracy of the sequence by gauging if the runner is moving down the line in the proper sequence. Ball moves to the webbing of glove and is still blurry, signifying that the ball is still moving and has some momentum. 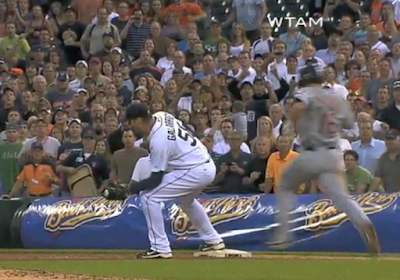 Also watch Galarraga's elbow as it is close to hitting Galarraga's thigh. Notice the ball is blurry, but the glove is sharp. It appears as if Galarraga has managed to snare the ball in his webbing in a snow cone fashion in the fifth frame, not the first frame as Instant Replay Implied. The image of the ball is nice and sharp, but for just one video frame. 1/30th of a second is not long enough to be considered a catch, or proper control. Probably the most critical frame of the entire sequence and one that needs to be carefully analyzed by MLB were they to do an investigation on this play. The Ball is BLURRY AGAIN. 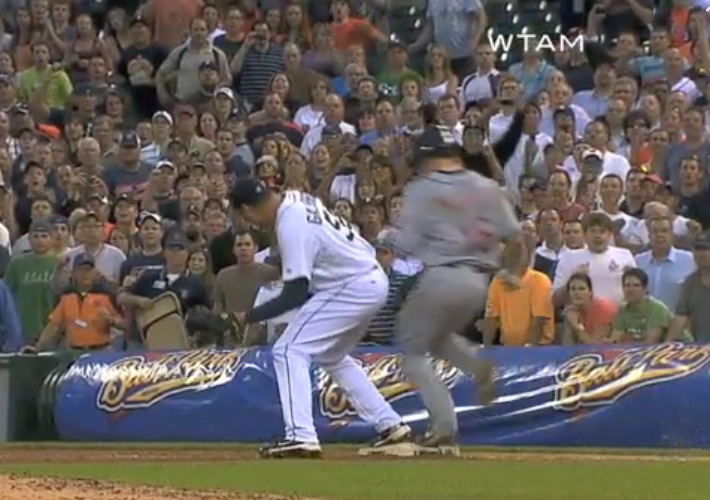 Galarraga's elbow hits his thigh, most likely sending the equivalent of a shock wave through his forearm and to his glove, while also causing Galarraga's forearm and glove hand to continue to move in a sweeping / swiping motion. 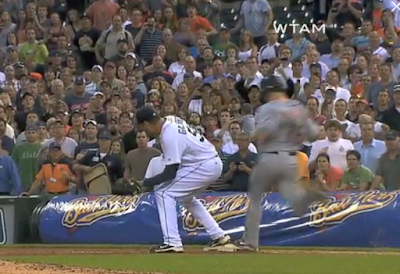 The acceleration of Galarraga's forearm appears to cause the ball to become blurry again and snow coned. 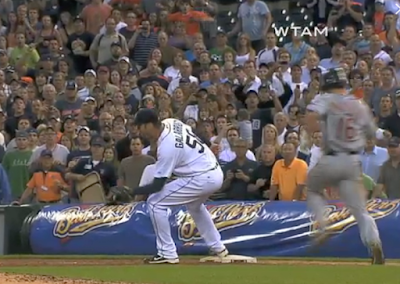 The blur of the ball most likely means the ball is moving within Galarraga's glove at a different speed than the glove. The ball is still snow coned in this next frame, and blurry, while the glove still looks sharp. Th ball also appears to have slightly extended outside of the webbing. If the ball was no longer moving around in the glove at a different speed or direction than the glove, both the ball and the glove would be equally sharp and Donald would be out. Unfortunately the next few frames appear to show the ball moving somewhat independently from the webbing around it. Galarraga's glove is not in complete control of the ball as the sweeping motion of the glove and the bouncing of his elbow off of his own thigh has caused the webbing part of the glove to move much faster than the heel part of the glove. If the ball were truly contained, then why does it make what looks to be a right angle turn within the glove? Is the ball and glove moving as one, or as two independent pieces of the same puzzle? If this had been the first baseman catching the ball, he would have had his feet set, glove outstretched, and simply squeezed the glove after the throw arrived. 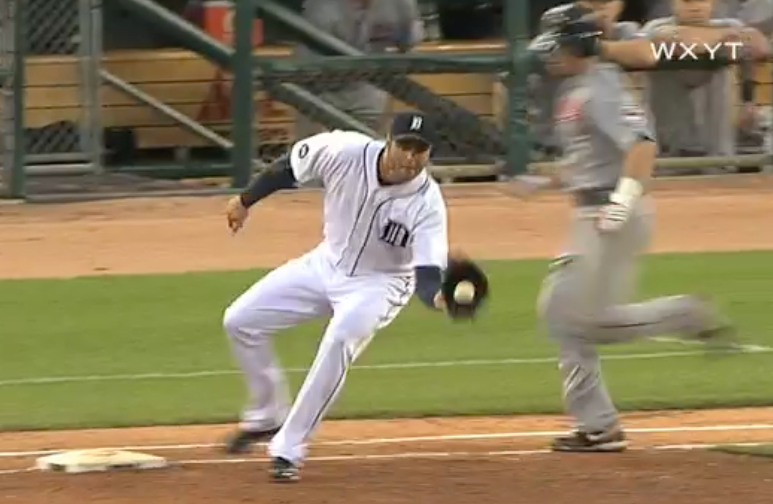 Unfortunately for Galarraga he had to run from the mound to first base and has many moving parts getting to first base while looking for the throw in one direction and first base bag below him. First it was Galarraga's elbow hitting his thigh, now that same elbow bounces or pivots off of his thigh causing the outer part of the glove to continue to move faster than the inner part of the glove. Notice the position of the ball to the webbing appears to have changed from the prior frame. 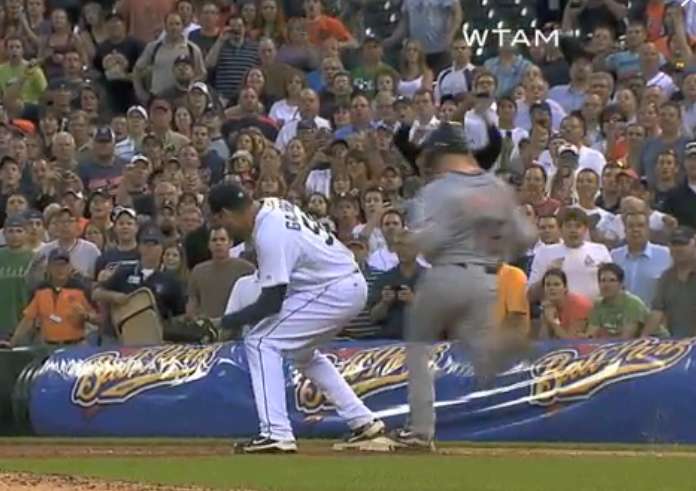 Also notice the OPTICAL ILLUSION that makes it look like Galarraga's glove is hitting his thigh up ABOVE, but BELOW, from a different angle, we can see that the glove is nowhere near the thigh at the same point in time. The lack of clarity of the depth of perception also applies to the ballistics of the ball. We cannot know for sure from this angle if the ball is "tromboning" inside the glove, but other angles seem to show that the ball was tromboning inside the Glove. Joyce's angle would have been the best angle to see if the ball was tromboning inside Galarraga's glove, something that the announcers and all the analysts never even considered. What caused the ball to Trombone inside the glove if indeed the ball did Trombone and was visible to Umpire Joyce from his vantage point in combination with the ball being snow coned at times? Dashcam Detective is going to theorize that it was Galarraga's elbow hitting his own flexing thigh that caused a "jolt" to transfer through the elbow and into the glove which helped create the tromboning effect of the ball moving within the glove. Umpire Joyce, standing about 13 to 20 feet away, could have seen the ball spin or rotate because of the seams, or trombone within the glove as he was staring right at the open glove and the snow coned ball. If the ball slightly moved as if detached from the glove even while within the glove, that would be the definition of a bobble and Jason Donald would be considered safe because he has now touched first base in the above picture. 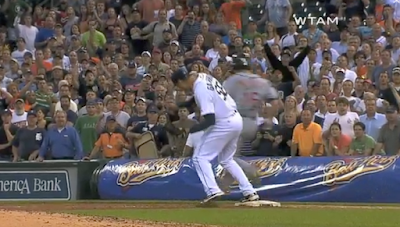 From Umpire Jim Joyce's vantage point he can clearly see the ball snow coned in Armando Galarraga's glove at various times throughout the end of the play. 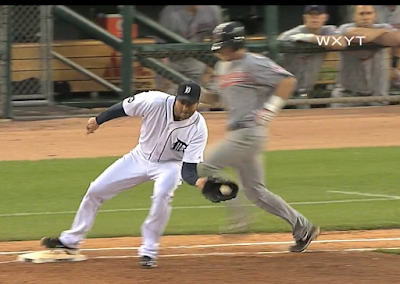 In this image Jason Donald is just a couple of video frames from first base while the ball was apparently still moving around in Armando Galarraga's glove, the snow cone changes frame to frame from this angle. A different camera angle or a closer camera angle might reveal if the ball was going forward and backwards (tromboning) in the Glove during the Glove's sweeping motion. Ideally a Camera Angle positioned where Jim Joyce was might have given the best visual information of all. One thing is certain, if you look at the GIF, the ball seems to make a strange 90 degree pivot just as Donald crosses first base. Criteria Number 2 missed by the Media, how all the moving parts in the play created a virtually incomprehensible task of calling the play or quickly analyzing the play afterwards. There were a lot of moving parts going on in what could have been the final play of a Perfect Game. There was Jason Donald streaking down the line in a very fast 3.76 seconds with the final second of his run most likely his fastest. There was first baseman Miguel Cabrera ranging far to his right towards second base to grab the ground ball and then wait a moment and then throw the ball so it led Armando Galarraga as Galarraga reached first base. 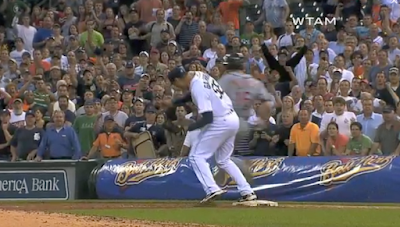 Armando Galarraga probably had the toughest job of all. Galarraga had to race to first base as soon as the ball was hit to make sure he got to first base ahead of a very fast moving Jason Donald. 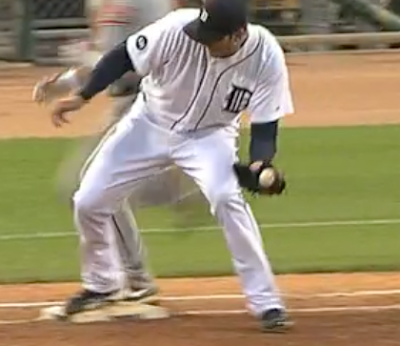 Galarraga also had to look away from the first base bag for the throw from Miguel Cabrera while also looking down for the first base bag so he could touch it with his foot. 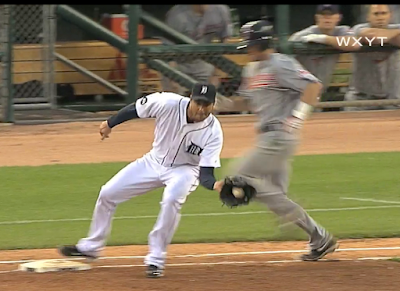 In retrospect, if the ball had been thrown sooner it would have allowed Galarraga to catch the ball and have more time to focus on just tagging the bag. Then there was Umpire Jim Joyce taking it all in in fair territory inside the right field foul line in the infield dirt portion about 13 to 20 feet from the first base bag. Present day Instant Replay probably would not have had enough time to truly study this play to see what Umpire Joyce saw from his angle, that is how complicated this play really was. 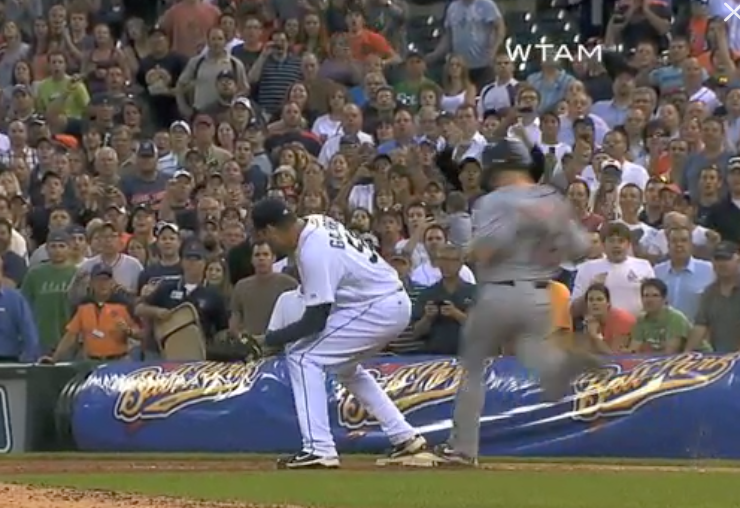 It's important to note that in all the discussions that came right after Jim Joyce's safe call and later on that same day, not one broadcaster or sports authority considered the possibility that Galarraga might have been bobbling the ball after it entered his glove. 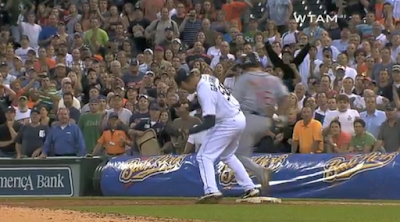 Everyone focused on when the ball entered Galarraga's glove, or when Galarraga's foot touched first base while never considering he may have bobbled the ball. The Media never also considered the possibility that Joyce's vantage point gave him a view that nobody else had and that his view might have allowed him to see the bobbling of the ball more easily than any other angle specifically because all the other angles are telephoto angles which compress the depth of the shot, and could mask certain types of ball movement as the ball moved around in Galarraga's Glove. While Video Evidence appears to exist that shows Galarraga was able to hold onto the ball in the webbing of his glove for a brief moment, Video Evidence also exists that appears to show that Galarraga's momentum created unwanted gyrations that make it look like he bobbled the ball more than once. Galarraga's elbow contacting his own thigh which then caused the webbing part of his glove to move in an accelerated swipe while the heel part of his glove moved at a much slower speed most likely created some type of unnatural ball movement that Umpire Joyce could see from his vantage point because the ball was snow coned while also appearing to Trombone within the glove. 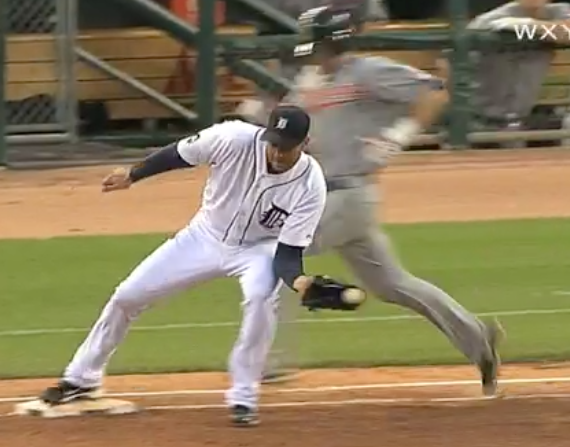 If you watch the GIF you can see the ball make a strange 90 degree turn while in Galarraga's glove. The Angle below is from the 3rd base dugout perspective. 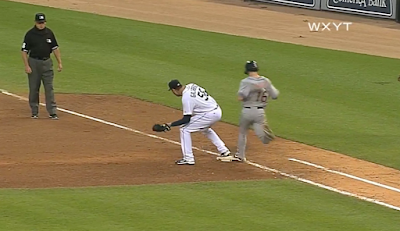 It too shows the ball moving towards the front of the webbing in Galarraga's glove. Above, Ball hits inside pocket and heel of Glove and begins new trajectory forward towards the webbing of the Glove. Above If you look closely you can see a small sliver of a white object inside Galarraga's glove, that is the ball moving forward towards the webbing of Galarraga's Glove. 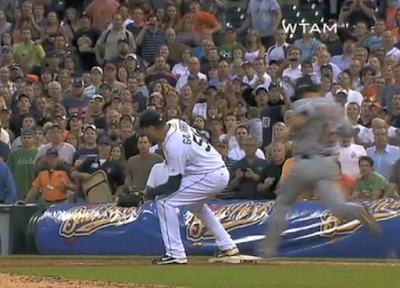 The white ball is now more easily visible due to the ball tromboning in Galarraga's Glove, clearly the ball traveled inside of Galarraga's Glove as Galarraga's squeezes the webbing. Galarraga squeezes glove and ball is temporarily contained in the webbing of his glove, each image represents 1/30th of a second so until we get to a quarter second of time, or 6 to 8 video frames, saying he has possession is a stretch, especially with his body still moving due to momentum. Galarraga's elbow hits against his thigh, causing the top part of the glove to accelerate at a different speed than the heel part of the glove. 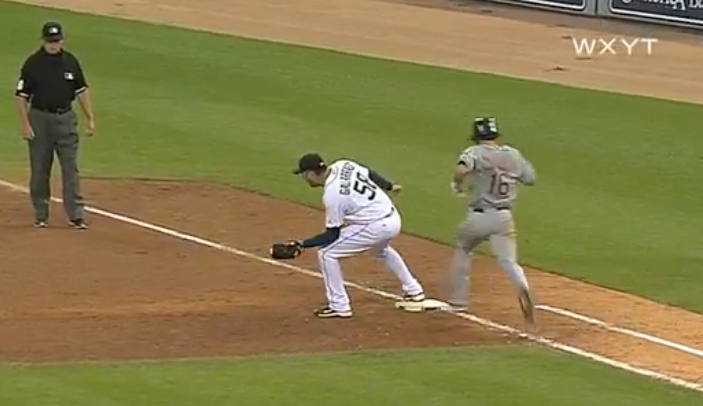 The glove swipes towards the first base bag. Umpire Joyce has a clear picture of the entire ball within the glove at this point since the ball is actually snow coned as seen from the previous angle and also from Joyce's perspective as well. Compare the tip of the glove to the tip of the ball that is barely visible to the lettering in the background tar[ directly underneath the glove. The glove's relative position to the graphics on the tarp in the background remains identical, however the ball has clearly tromboned back inside the webbing. The ball, while contained in the glove, has not settled, it appears to be moving and the movement would be clearly visible from Umpire Joyce's perspective. 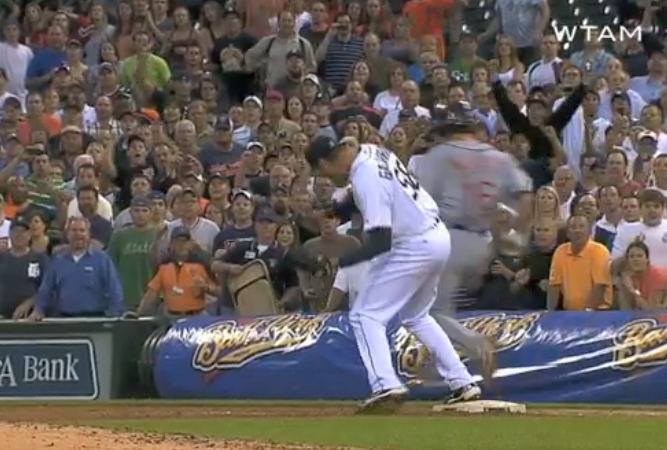 At this point, Jason Donald's foot is touching first base. Ball has completely disappeared inside Galarraga's Glove, One might want to say this is the first frame where the ball has finally settled and Galarraga had possession, Jason Donald's foot is clearly on the bag, as it was in the prior frame as well. 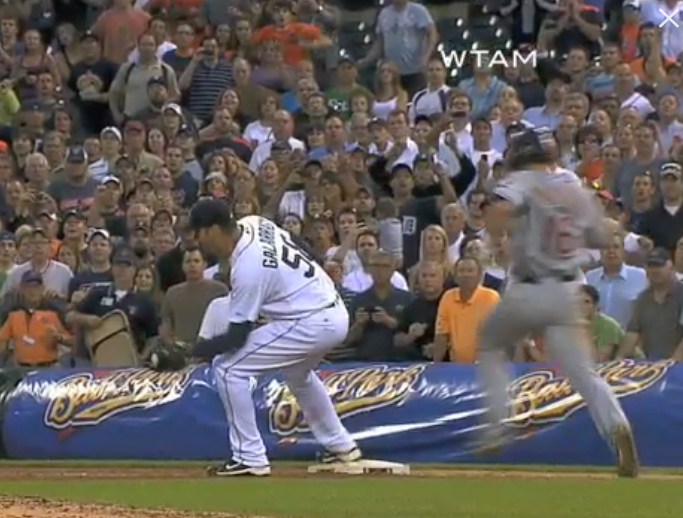 Galarraga's glove looks skinnier in this frame than the prior frame above. 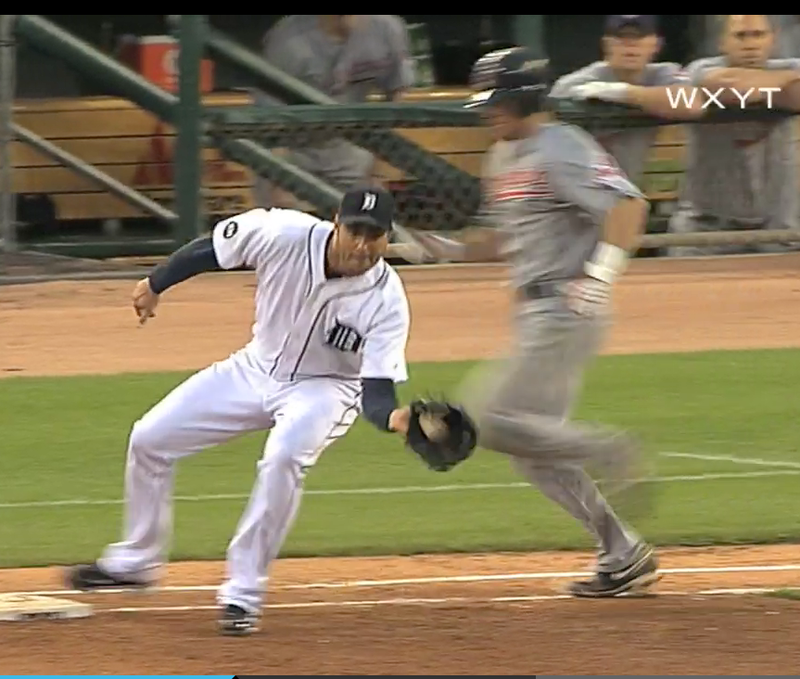 It appears as if this might be the frame where Galarraga contains the ball. Jasn Donald has now touched first base for 3 video frames, or 1/10th of a second. Once again a very small sliver of white appears at the tip of Galarraga's webbing. Umpire Joyce would have clearly seen the ball's tromboning movement since from his perspective the ball is snow coned. (see first sequence of pictures). The last four frames, ending with the frame above, show the first two frames with no sliver of the ball outside the Glove, and the last two frames show the sliver of ball at the tip of the glove. 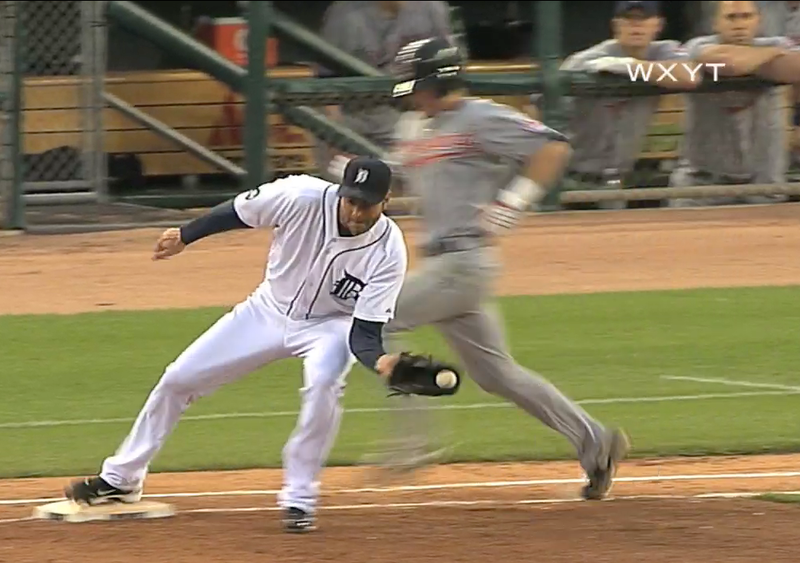 Could it be that Galarraga's glove went as far as it could in one direct, and now has moved back, thus revealing the sliver? At this point Donald has clearly crossed first base and is slowing down. However, what may have ultimately done Galarraga in is the final pop of the baseball in which he let it pop up and then drop into his glove. That happened a several frames after this point, had nothing really to do with the play, however, because the entire sequence was a mish mash of moving parts with the ball looking like it was contained then not contained at least twice, could the final pop of the ball up in the air and then settling back into the glove sealed the call as safe? The ball may be contained at this point, clearly Galarraga was concerned about avoiding the baserunner. Up above appears to be the moment when the ball has settled within the glove. And unfortunately for Jim Joyce, Jim Joyce's vantage point was the BEST vantage point to see if the ball was slightly moving within the glove, aka a bobble. And unfortunately for the rest of us, the telephoto camera angles that show the ball in the webbing compress the depth of field so much that if the ball was moving, spinning or tromboning within the glove, it would be more obvious to Umpire Joyce than any of the cameras in Telephoto Mode that were used to record this particular play. Galarraga ended up bracing his elbow against his thigh, then just a moment later, his glove makes a swiping / sweeping motion that seems to have caused the ball to move while it was still in the webbing. Galarraga's elbow suddenly contacting his side caused his arm to create a sweeping effect which caused his glove hand to speed up as it swept towards his body. That set up the moment that probably put doubt in Jim Joyce's mind. The ball and movement of the glove do not seem to be in lock step with each other. So what we have now is ball hits heel and inside lower pocket of the glove, bounces towards webbing, is clasped in the webbing, then glove lurches towards Galarraga's body because of Galarraga's momentum and his elbow acting as a contact / leverage point against his own thigh, the top side of Galarraga's glove is moving much faster than the heel part of the glove, causing the ball to probably slightly rotate and move in a n in and out trombone fashion while still remaining within the webbing of the glove while also intermittently protruding just a bit from the webbing of the glove. Then Galarraga does one final adjustment with the ball in the glove, letting the ball pop up and then go back down in the glove after Donald has aready passed first base, but that may have added a final seed of doubt in Jim Joyce's mind. Dashcam Detective's view is the play at first base in the Imperfect Game of June 02, 2010 was much closer than has ever been attributed to by the media, and that it is possible that Umpire Jim Joyce saw the ball being bobbled leading to his safe call because of his vantage point. So why did Umpire Jim Joyce admit he got the call wrong after the game was over? Mr. Joyce most likely was shown video evidence after the game that included the freeze frame right when Galarraga first touched base and right when Galarraga first had the ball enter the glove, thus not revealing the bobbling that was probably going on. Dashcam Detective believes no time was taken to explore the possibility that the ball was bobbled and no time was spent with Mr. Joyce exploring the possibility of a bobble. For those who may agree that the ball was bobbled, but why make a big deal about it? 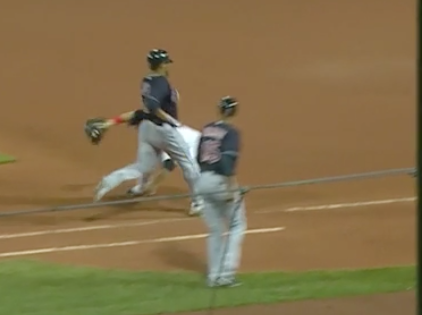 The analogy DD can give involves when a runner steals second base. If the runner slides late in an effort to gain that little bit of extra speed, but as a result they lose contact with the base while the infielder has the ball in their glove and are applying the tag, Instant Replay will say the runner is out. There are trade offs for sliding late in an effort to successfully gain speed so a base can be stolen. 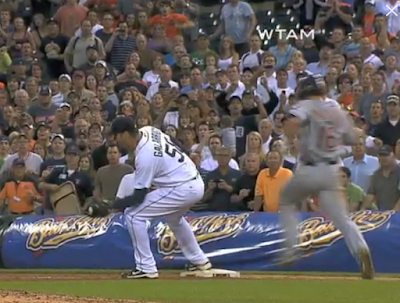 In the case of Armando Galarraga, Jason Donald's speed down the first base line caused Galarraga to have to run the race of his life to get to first base ahead of Donald, and that process caused Galarraga to have less room for error in the act of looking for the throw, catching, and then controlling the ball in his glove while also looking for the base on the ground. If the runner to first had been one half second slower in a still respectable 4.25 seconds, Galarraga would have had the time to either fully contain the ball before the runner touched first base, or he could have slowed down a step sooner before reaching the bag to make sure his body did not contort as much as it did because Galarraga had to run so fast to first base. The result would have been a more in control pitcher with the ball in his glove and no bobbling, or what looks like a bobble. And if Donald had not been so fast, Galarraga could have even caught the ball and just run over the bag into foul grounds and had his perfect game. It seems a bit unfair to not give Jason Donald any credit for running hard to first base which seems to have created just enough of a margin of doubt, especially from Umpire Jim Joyce's point of view. Breaking News, Never Seen Before Video Replay of the June 02, 2010 Imperfect Game between Detroit and Cleveland. Update Number 4. Monday, September 17, 2018, 1:25pm. 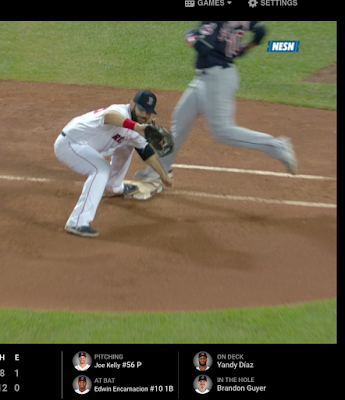 Still Photo Sequences and a Link to a GIF have been added in the most recent version of the Jim Joyce Imperfect Game. Update Number 3. Saturday, September 15, 2018, 9:30pm. Please check this link for the most recent version of this James Joyce Imperfect Game story. Still Images and a link to a GIF will be added thoughout this night to the link above. Update Number 2. Dashcam Detective is working on a new version of the play at first base in the Imperfect Game of June 02, 2010. Dashcam Detective has determined two truths, no one angle exactly showed everything that happened in regards to the movement of the ball, and that it will take a series of stills from two angles to tell the story. I will post a link here when the new research is finished. 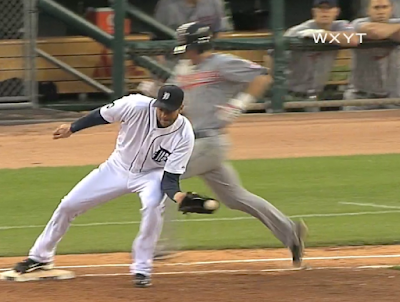 This video clip of Jason Donald running down the base line to first base to break up Armando Galarraga's Perfect Game attempt has never been seen before BECAUSE THE FREEZE FRAME HAS BEEN REMOVED FROM THE MIDDLE OF THE SHOT. (I have to use CAPS because some people are just viewing the video only and not realizing what the critical difference is.) Correction. In the beginning of July of 2018 MLB released all the angles of the Imperfect Game, including the one that Dashcam Detective removed the freeze frame from. However prior to July of 2018, Dashcam Detective could never find the angle anywhere on Youtube. Whether your mind is changed about Jason Donald being safe or not, can we at least conclude that Umpire James Joyce saw that Galarraga was bobbling the ball and that influenced his decision? Joyce probably NEVER saw this play the way it is depicted below. WITH THE FREEZE FRAME REMOVED when he was invited to reviewt he play after the game. After the game the instant replay crew most likely simply showed Jim Joyce the same instant replay that was shown during the game, and that would be with the freeze frame included in the middle of the sequence. Almost Never before seen video below, FREEZE FRAME HAS BEEN REMOVED FROM MIDDLE OF SEQUENCE. After clicking on the play arrow above, the ball is easier to track if the right lower side enlarge icon is clicked. Click on same icon to exit full screen image. As you watch the above video, please keep in mind that it is in Slow Motion. Slow motion will slow down the movement of the ball by a significant factor, making it look like the ball is more in control than it actually was. Although the video above is ground breaking in terms of showing what has never been shown before, anywhere, if MLB actually has the original video and played it back in real time and removed the freeze frame as has been done here, it would most likely be even more apparent that the ball was being bobbled by Galarraga as he stepped on first base. Below we can see the original replay version of this play that was broadcast in the Cleveland Market. The exact same angle below is the ONLY version that everyone in the world saw, but it includes a freeze frame inserted just as Galarraga touched first base. 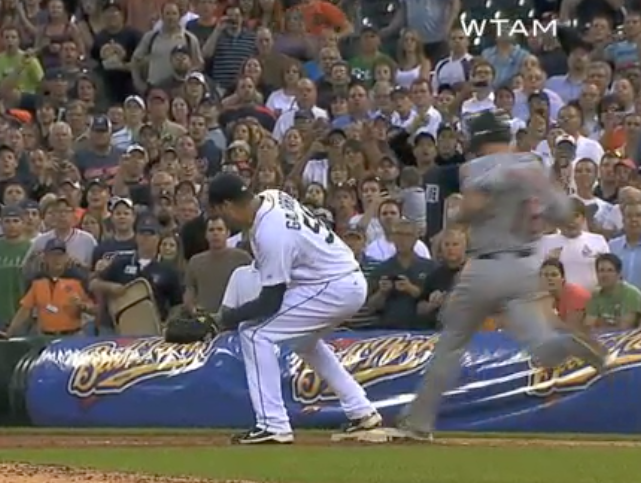 The freeze frame interrupted the flow of the play and basically obscured that Galarraga appears to be bobbling the ball. 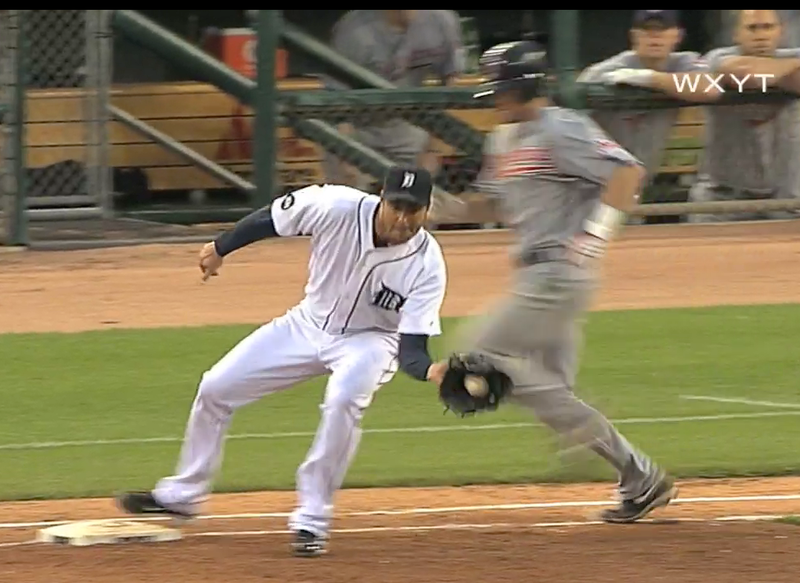 This is the freeze frame heard round the world that obscured that Galarraga was bobbling the ball as he touched first base. There are two kinds of bobbles, so lets review them. When an outfielder is trying to catch a fly ball they may bobble the ball as many times as they want, as long as they eventually hold on to the ball without the ball touching either a fence, wall, or the ground, and the batter is out. However, if there is a runner tagging up to advance one base, as soon as the outfielder touches the ball, the baserunner is free to leave their base and advance. In this instance, the baserunner Donald is free to keep advancing down the first base line until the ball has been contained by Galarraga while Galarraga's foot is simultaneously on the base. 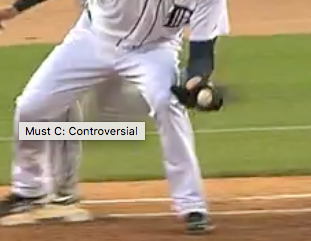 So just because eventually Galarraga contained the ball does not give him retroactive rights to claiming possession when the ball first entered his glove. Galarraga can be credited with getting the out once the ball is contained in glove, his foot is on the base, and the runner has not yet reached first base. Sometimes people confuse catching the ball at first base with an outfielder catching a fly ball. Many think as long as eventually the ball is contained in the glove without first touching the ground, the time of possession starts when the ball entered the glove. But lets go back to our previous example above, the runner tagging from a base can leave as soon as the ball touches the outfielder, the runner gains an advantage from contact with the ball by the outfielder, irrespective of all else. Perhaps an umpire can clarify this, I am suggesting the same rule applies to a baserunner chugging down the first base line line, they can keep advancing towards first base until the ball is contained in the glove and the fielder with the ball is touching first base. I don't recall ever seeing a first baseman have a throw enter their glove, the ball then bounces off of the inside of the glove into the air, the runner crosses first base, the ball lands back into the first baseman's glove, and the runner called out. Can you ever recall a play like that? I can't. For a more complete analysis of this play, please click here. 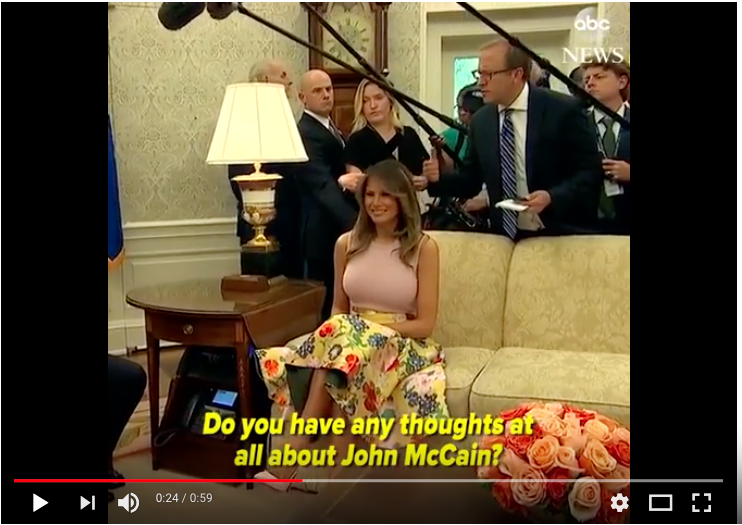 ABC News Reporter Jonathan Karl's Lapel Microphone creates False Narrative in Trump vs McCain Tribute Controversy. I'm not going to accuse ABC News of intentionally doing what they did, but what they did did not accurately reflect the reality of the situation. 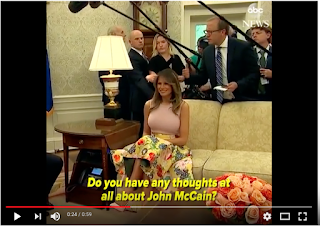 On three occasions ABC News reporter Jonathan Karl is clearly heard asking Donald Trump about John McCain. Please watch the video below by clicking here. After watching the video, do you recall how vivid Jonathan Karl's voice was? This is because his own lapel microphone is recording his voice. Karl's voice sounds so crystal clear that it makes Trump ignoring Karl that much more ominous. However, the real reality is that Trump could not hear Karl as vividly as we can. There were all kinds of people yelling at Trump from about 10 to 20 feet away, Karl's voice was probably still audible at that distance but it would have been mixed in with all the other voices in the room speaking at the same time, creating an overall buzz of audio as multiple people were yelling at the same time. The Dashcam Detective watched other angles of this event and the audio was definitely much less vivid, just as loud but much less intelligble as many many more voices were all shouting at the president, all at the same time. Dashcam Detective is not taking a side here politically, just pointing out that the position of the Lapel microphone on Jonathan Karl's did not give a fair representation of the actual overall audio sound in the room and most definitely did not come close to matching what the President was actually hearing from his own vantage point. Yet the unsuspecting viewer will just presume that Mr. Trump was hearing Mr. Karl as clearly as those watching the video were, and that, is fake news. Is Major League Baseball Instant Replay becoming tainted on a Local Level before the play is even Reviewed by Major League Baseball? 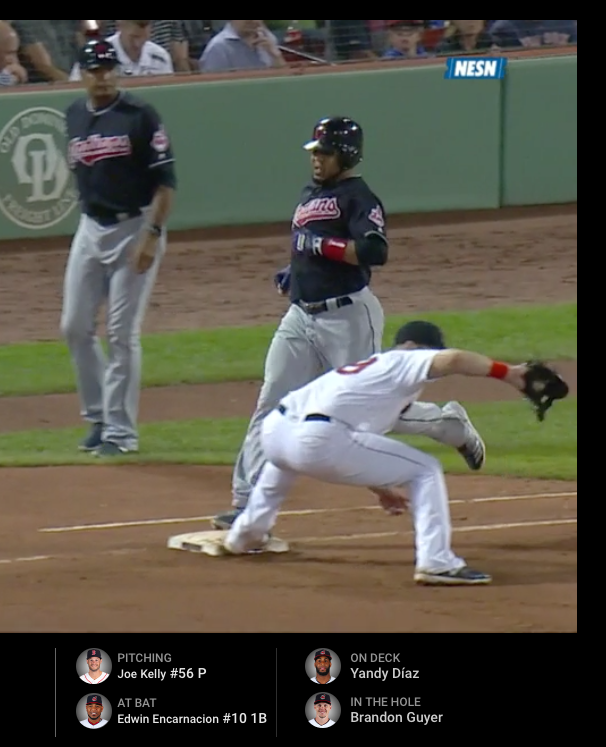 In the August 22, 2018 MLB Baseball game between the Cleveland Indians and the Boston Red Sox, Red Sox announcers erroneously claimed that Edwin Encarnacion was out at first base. The photo evidence proves otherwise. Above the ball is approaching first baseman Mitch Moreland's mitt. Below the ball is about to enter Moreland's mitt. The frame below is the frame that the Boston Instant Replay crew claimed proves the ball had been caught by First Baseman Moreland. However, the ball actually hit the top webbing of Moreland's glove, then ricocheted into the middle webbing of the glove. Can the call be considered caught before it is held firmly in one position inside the glove? Announcers and Replay crew claim the above frame is the frame that shows the first baseman has caught the ball in his mitt. Below is the reverse angle, the ball actually entered the top part of the glove webbing, then richocheted into the middle webbing of the glove, as can clearly be seen below. Below the ball is now in the webbing part of the glove, but the glove is still OPEN as evidenced by the span of the glove that is visible. Can possession of the ball exist if the glove is in the open position? Unless the ball were to hit the webbing so hard as to stick halfway through the webbing and not be able to move anymore, an open positioned glove is a questionable frame to pick to establish possession of the ball. 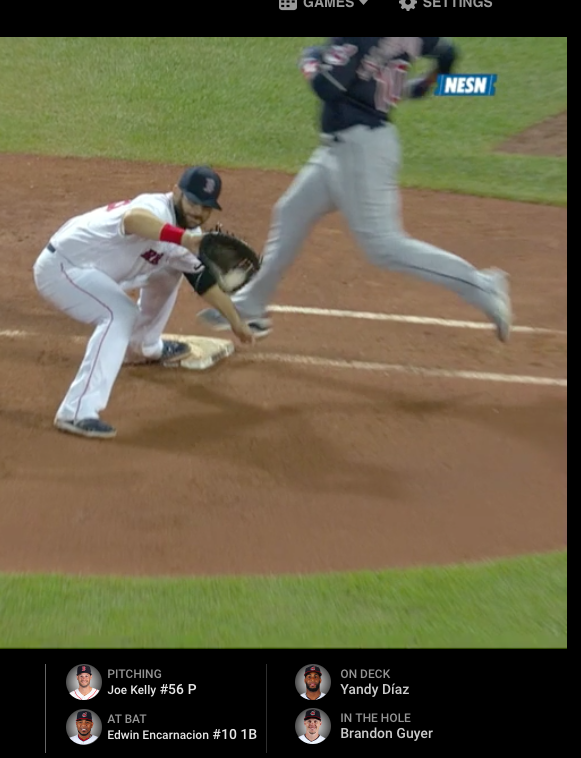 Above we can clearly see the ball in Moreland's glove, but the glove is still open, if Moreland did not close his mitt shut, the ball would fall out. 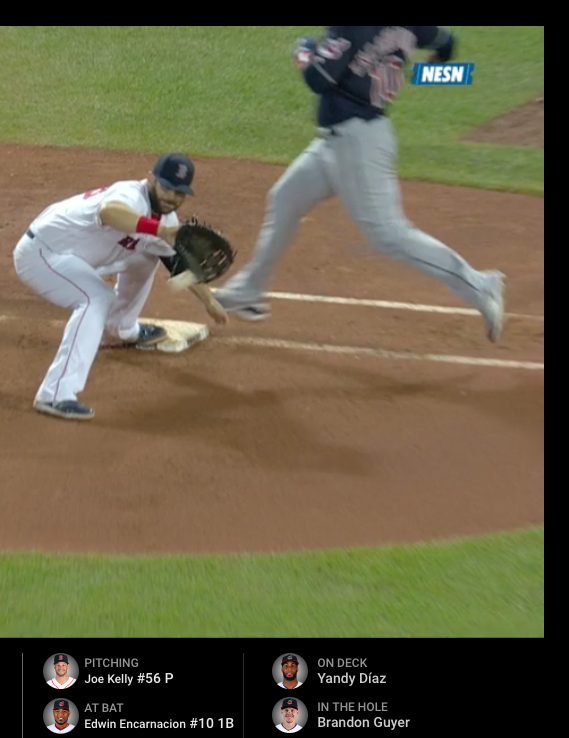 Below we can see Moreland squeeze the glove shut, this is the actual point where the ball can be considered officially caught. 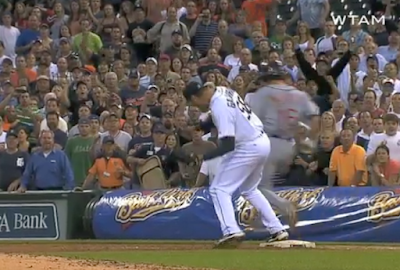 Edwin Encarnacion's foot is clearly on the base. The frame below is when the announcers and the Home Field Instant Replay crew CHOSE to FREEZE the FRAME to make the point that the ball was caught. We'll call this Premature Webbification. The ball is clearly in the mitt, but the glove is WIDE OPEN, can this moment in time be considered when the ball is caught? if the Glove is not closed the ball will fall out. Compare the frame above and the frame below, in just that one micro instant the ball clearly is still moving, from the top of the glove in the picture above to the center of the glove in the picture below. The glove is still open in both frames. Unless the mitt is closed the ball will fall out, hence neither the frame above nor the frame below should be considered the point at which the ball was officially caught. 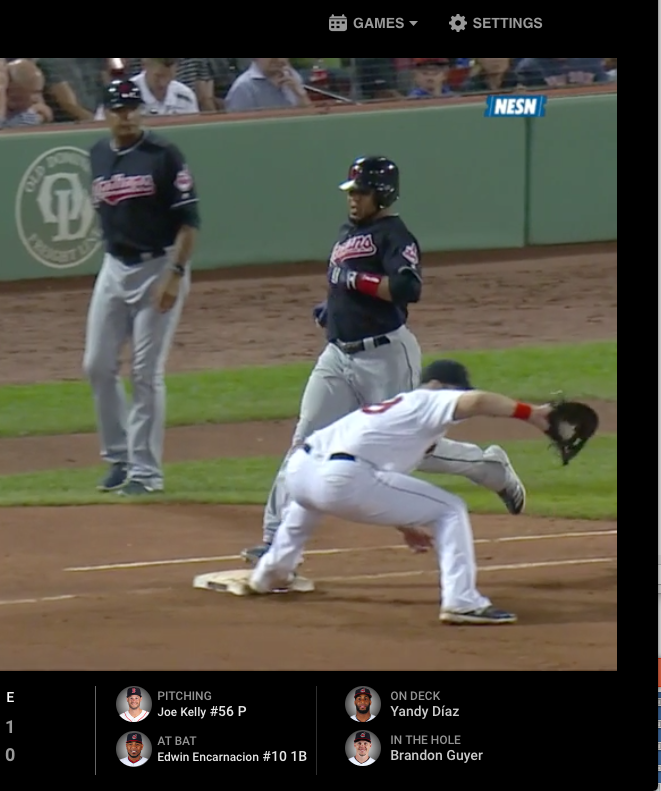 However the Boston Television instant replay crew choose a premature frame to freeze to create a groundswell of support among the Boston announcers and the fans watching the replay on the big screen that favors their own possibly biased point of view. Comparing the picture above and the picture below we now see the glove closing below. However, the glove is still not completely closed. 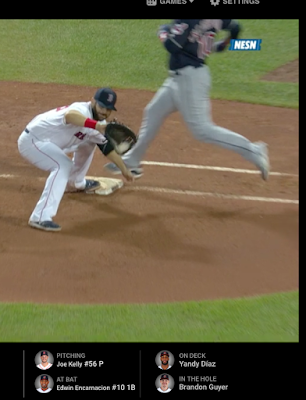 One could argue that first baseman Moreland has secured the ball with the palm area of his glove in the picture below. 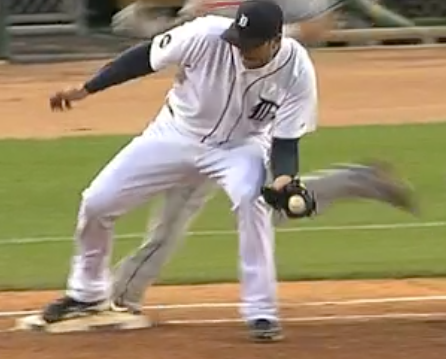 However, guess whose foot is now CLEARLY on first base, that would be Edwin Encarnacion, aka, SAFE. Because it actually takes three frames to create proof that the ball has indeed been caught and held by the first baseman, the frame below is actually the first frame that we can for sure say the ball is firmly held by first baseman Moreland's clenched glove. Down below is the actual first frame where we can officially say that Mr. Moreland has grasped the ball within the glove in a clenched position. 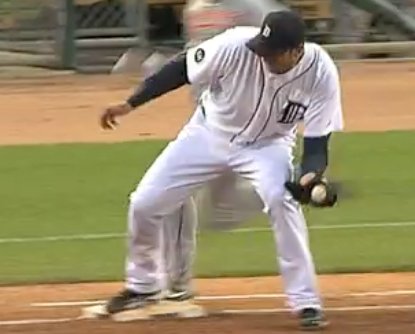 Edwin Encarnacion's foot is CLEARLY on the first base bag, as it was on the prior frame as well. A pitcher once threw their mitt with the ball stuck inside the glove to the first baseman, but the glove itself was clenched and in the closed position. The ball entering the glove is CLOSE to when the catch is made, but it is not the actual frame that the home field Instant Replay Crew should be using to determine when the ball actually has been caught. Dashcam Detective's question is, Is Major League Baseball being influenced in anyway by the Home Team's Instant Replay crew, the baseball announcers, and the home field crowd, into accepting their judgement when determining if a player is safe or out? Or, is this simply a situation where everyone is accepting the ball entering the glove as being the reference point for a safe or out call? The Home Town Instant Replay crew has the ability to enflame the announcers and the home field crowd by freezing the wrong frame for all to see as "proof" of when a baseball has been caught. Dashcam Detective believes that even though New York Instant Replay is supposed to be separate from where the game is being played, if they are listening to the broadcast and viewing the selected freeze frames provided by the home team's Instant Replay crew, they can be swayed into a pre-conceived decision based on incorrect freeze frame selections. If the New York Instant Replay crew is not being influenced by the local Replay Team, why are they selecting the frame prior to the ball actually hitting the glove and being squeezed? Edwin Encarnacion was originally ruled safe, and the call was reversed, was there enough evidence to overturn the call if the call is being based on when the first baseman has firm control of the ball? Let us not forget that the first baseman can use a bigger glove to have a better chance of catching the ball. But the bigger the glove, the more chance there is of the ball not being firmly held in the glove as quickly as if they had used a more normal sized glove. Baserunners who attempt to steal a base and start their slide late to make sure they have more speed to beat the throw, but then slide either past the base or momentarily lose contact with the base while the tag is being applied are ruled out. The same guideline should be being used at first base. It's not when the ball enters the first baseman's mitt, it is when the ball is firmly in the first baseman's mitt that matters, the bigger the glove, the more likely that the ball will take a moment longer to settle within the glove, and when possible, the Instant Replay Crews should be acknowledging an extra frame or two when determining possession of the ball. Dashcam Detective asks, what if this had been a playoff game? Holy Crap, Dashcam Detective gets excoriated on LinkedIn for Talking about a Person's Gloves. 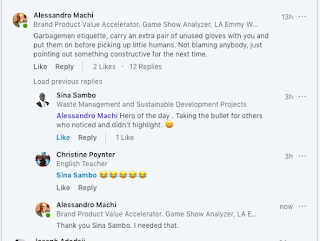 Some LinkedIn Members went crazy against DashCam Detective's necessary comment. If Dashing you is wrong, I don't want to be Right. Dashcam Detective is merely pointing out that this very nice young man didn't take his filthy gloves off before his kind deed. The deed is still kind, and his gloves are still most likely filthy, so why all the hate from LinkedIn members? Dashcam Detective was not even looking for a problem when watching the feel good Video. 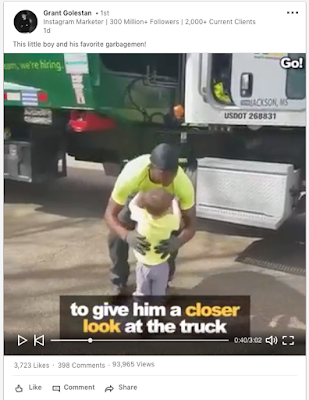 Yes, Dashcam Detective cringed upon seeing the kindly gentlemen pick up the child with his presumably filthy gloves. But then Dashcam Detective figured he would put the kid down in a moment or two. But then kindly hero did not. Kindly Hero kept doubling down on his good deed as I attempted to spray some lysol through the screen to save the boy from those evil, germ defying gloves. Maybe the Kindly Heroes goodness had killed the myriad of germs cohabiting on the glove he was using to pick up each and every can of refuse prior to picking up the boy. Since apparently DashCam Detective's truth is not enough, DD would like to take all the hostility generated by DashCam Detective's observation and comment and convert it into a positive. 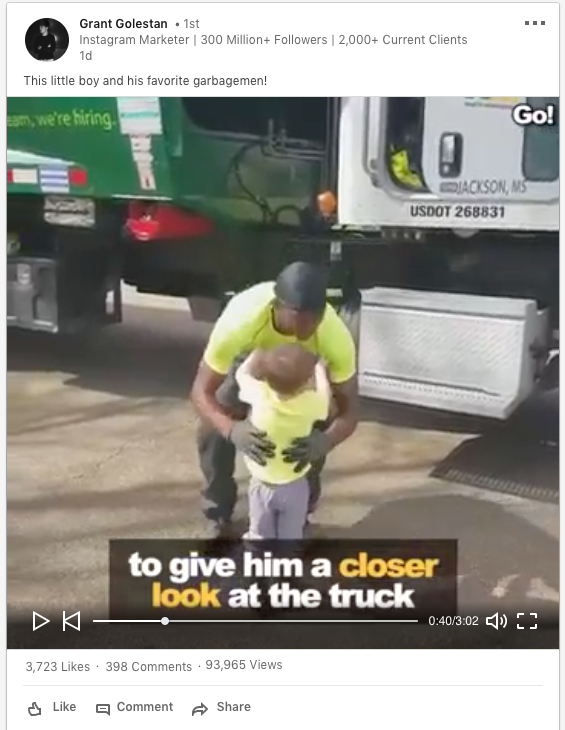 I am asking all Bureaus of Sanitation in the U.S. to show this video to their employees, applaud the efforts of the man in the video, and then remind their own employees to either take their gloves off when handling a child in a non-emergency situation and one approved of by the child's parent or guardian, or to have a spare set of NEW gloves readily available and to use those before picking up the Child with the prior consent of the Parent or Guardian's. An update! No sooner had Dashcam Detective posted this story then Sina Sambo came to Dashcam Detective's Defense. 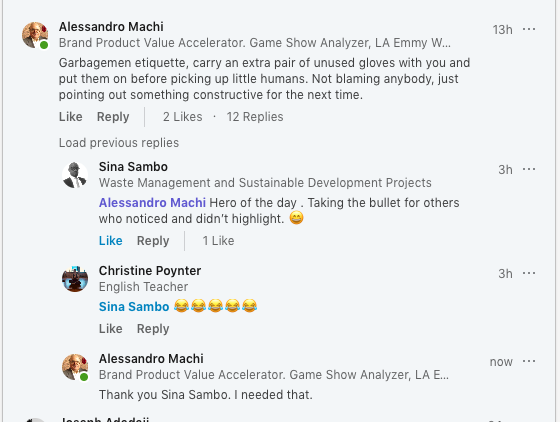 Being in Waste Management, Sina's comment carries some weight, no? The Imperfect Game Bobble from June 02, 2010, Cleveland vs Detroit. Even if you think Jason Donald was out at first, at least doesn't it make sense from Umpire Jim Joyce's point of view (about 14 to 20 feet away inside the right field foul line) that Joyce would have seen Galarraga not firmly containing the ball within the glove while Galarraga was also in motion the entire time? 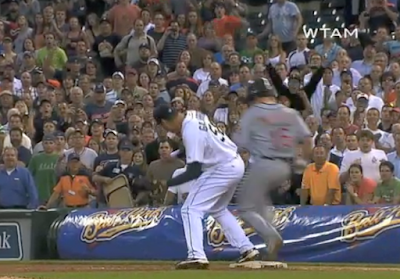 Full Analysis with critical freeze frame evidence explains in painful detail all the little things that made it look like Galarraga might have been bobbling the ball from Jim Joyce's Vantage Point, and can be found by clicking here.